Investor market sentiment turned even more optimistic and greedy last week. So from a contrarian point of view because investors are historically wrong about where the market is headed, we once again suggest you lighten your portfolio. The Ned Davis short-term indicator, which was in mid-40 neutral territory a week ago, this week moved up to an optimistic and worrisome 60. Why worrisome? That’s because 70 means extreme optimism, and is a resounding sell signal. Meanwhile, the CNN Fear/Greed Index moved up to higher into greedy territory at 61 from 59 the previous week and a neutral 43 the week before. Intermediate term indicators have also deteriorated. 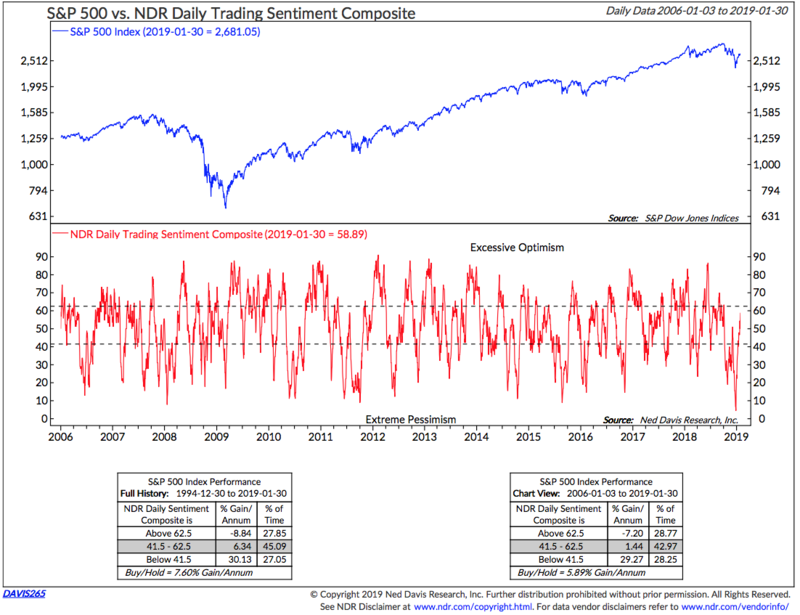 The NDR crowd sentiment moved up to 59. Still in neutral territory but trending more optimistic. The Investors Intelligence poll of market newsletter writers was 47% bullish and 20% bearish. The spread is over 25%. A spread of 40% is extremely bearish and a definite sell signal. What’s also worrisome about this poll is that despite the markets’ volatility bearish sentiment remains unusually complacent in the low 20s.